What is home-based occupational therapy? Occupational therapy teaches how to do things many of us take for granted, like toilet hygiene, dressing, eating unassisted, and socializing. People of all ages receive occupational therapy to help them participate in the activities of daily life. Home-based therapy helps to maximize a person’s activity level in their own home. Occupational therapists take into account the home layout and equipment requirements when creating a personalized plan for care. Do I need an occupational therapist? Are you looking to regain or maintain a level of independence that will allow you to age in place for as long as possible? Do you find yourself socializing less with family, friends and participating less in the community? Has it become difficult to carry out your daily routine, mobilize around your home or the community, bathe, groom, dress, cook, self-feed or complete toilet hygiene? Are you recovering from surgery or other various medical conditions, where you need to regain important life supporting skills? 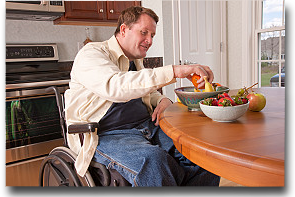 Our focus is to help you to complete daily tasks and routines with the utmost safety and independence. This will require assessment and training of the tasks themselves within the home with a skilled Occupational Therapist. It may involve assistive devices and technology or adaptations to your home environment. Ultimately, we will help you reach optimum lifestyle goals to maintain independence and improve your quality of life at home. What will my therapy include? An individualized evaluation of performance skills. An assessment of activity demands. A customized intervention program to improve the client’s ability to perform daily activities/tasks to reach the goals . Recommendations for durable medical equipment, home adaptation/modification, assistive devices and technology as needed. We provide services on a private pay basis; however our services may be covered under Medicare benefits. Feel free to contact us for a no obligation consultation. We look forward to serving your needs.